Just wanted to post this pinout here because the question often comes up in the Yahoo Scorbot User Group which has its search function messed up and people cannot find older posts. 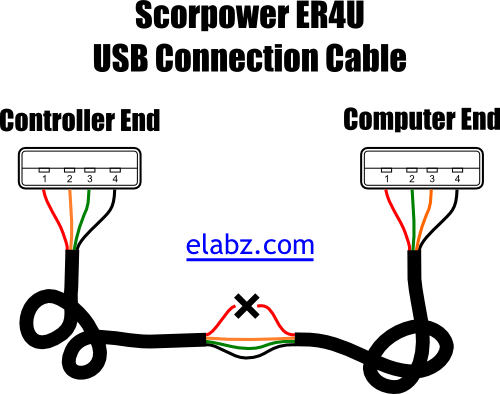 So, yes, the Scorbot ER4U (Scorpower ER4U is the name of the controller) USB connection cable is basically a straight-through USB-A to USB-A with +5V wire cut-off. 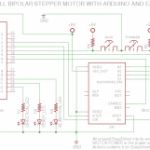 Note that technically you should swap the “+” and the “-” signal wires, which is how I show it on the diagram but since USB signal pair is balanced, the polarity does not matter and so you can just splice two factory-made USB cables. Just don’t forget to remove the +5V (usually red but double check that!) wire at the splice point.